Sagittarius Zodiac OhSoy! Mason Jar Soy Candle 16oz. 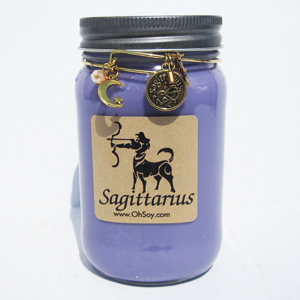 16oz Mason Jar Soy Candle - Candle includes a removable Sagittarius charm bracelet. Scent Description: A blend of soothing herbs, including delicate chamomile, cool spearmint and fresh lemongrass.